Feeling lost in a confused and hostile world? Sad … hopeless … desperate? Hungry for words of comfort to feed the weary soul? We can’t promise the answer to all of life’s problems (though ‘quit whining’ is a much under-appreciated piece of ageless wisdom), but cough up ten bucks and you’ll get the best of The Salt Lake Tribune’s award-winning humor columnist Robert Kirby (with a cover illustration by Tribune cartoonist Pat Bagley. The newest book from Robert Kirby is as funny and thought-provoking as his last five humor titles; but maybe it’s even more important because he allows himself to be serious at times. Sobering moments of truth mixed in with his off-kilter humor make this a book that should be read and appreciated by every Utahn, Mormon or not, and every Mormon, Utahn or not. Kirby is a keen observer of Utah and Mormon Culture, he is never shy about pointing out, in the funniest ways, our flaws, foibles and weaknesses as well as our strengths. The cover art is by Pat Bagley. NAUVOO TIMES By Laurie Williams Sowby “About as unscholarly as you can get and reeking with attitude [when compared to another review in the same column] is the latest collection of Salt Lake Tribune columns by Robert Kirby, once a beloved cohort of mine at a newspaper. (He’s still beloved, just no longer a cohort.) 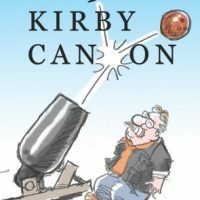 The Essential Kirby Canon reflects “20 Years of Shooting from the Hip” in 140 pages (Zion Book Works, paperback, $9.95). He’s still lampooning the Utah Mormon culture, but this Kirby is a softer and more [word left out] version of the one in previous volumes (and years). While there’s still wry humor (launching bowling balls from cannons — really? ), there’s also a lot more introspection and philosophizing (“One of the toughest jobs in life is to be yourself when you’re stuck in the middle of everyone else”). Deeper threads are woven as he explores dressing the part for a pioneer trek, his wife’s penchant (and his disdain) for vegetable gardening, the essentials of an emergency kit, the dogs that have “peopled” his life, and coping with “faithful” members who see him and his Trib column as a tool of the devil. Squadrons of writers publish books they consider funny. They’re usually mistaken about that. Kirby, on the other fist, publishes short, quick jabs to the jaw that are almost always knockouts. Doesn’t matter what he’s talking about–kids, parents, church, prison, good food, lousy food, dogs you love , dogs you’d like to feed to the nearest bad-tempered badger. You can count on Kirby’s work to be short, funny, respectful but irreverent (show me THAT in your run-of-the-mill funnyman), and yes, insightful. You’ll laugh, and while snorting, you’ll learn something worth thinking about. I’m in my 80th year, and I’ve been reading Kirby for at least three or four of those decades. In the CANON, his aim is sharper than ever. And the bonus is that you can give this book to anyone as a present. Those few who don’t “get it” obviously need it, and Kirby’s the sharp-shooter to ding them right in the funny-bone. Gives Dave Barry a run for his money. Quite entertaining and well written. Robert Kirby does it again. I have followed him for years in the Salt Lake Tribune and really enjoy his commentary. We’ve enjoyed his column in the SL Tribune for years; nice to have a compilation of the best!